Lovers of word games are in luck. People Etermax, creators of the well-known Apalabrados , has launched today for the premium version of its new title called Mezcladitos for download from the App Store, from € 2.69 to free. New game, new rules and just as addictive is what defines this new title Etermax, which has positioned itself as one of the most popular word games with interaction between friends and strangers. The game features a leader board where we have to find the maximum possible words in two minutes time. The words are to be formed by letters arranged adjoining each other in lateral direction, vertical or diagonal. We will have the option to acquire certain wildcards (power-ups) that will facilitate those moments when we do not find any words, but each of them cost a play money (coins), which we shall exhausting. 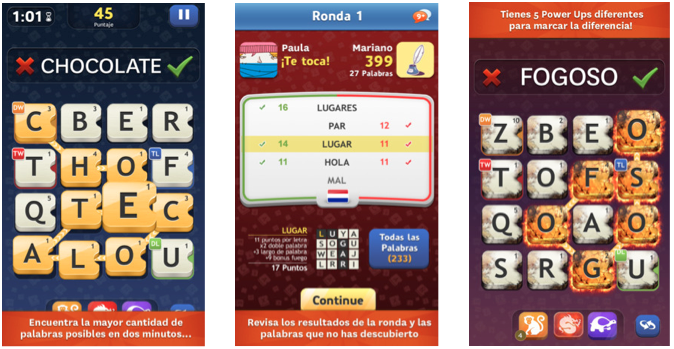 With an interface similar to Apalabrados regarding main menu display active and completed items, search for friends, language selection or display user profile, this new title will force us to speed up the mind and try to find words linking the letters together. Do not miss this opportunity to meet you both enjoy this version completely free of advertising. Here's the link to the App Store, where you can find it for free during the day, being an application compatible with iPhone, iPad and iPod Touch.